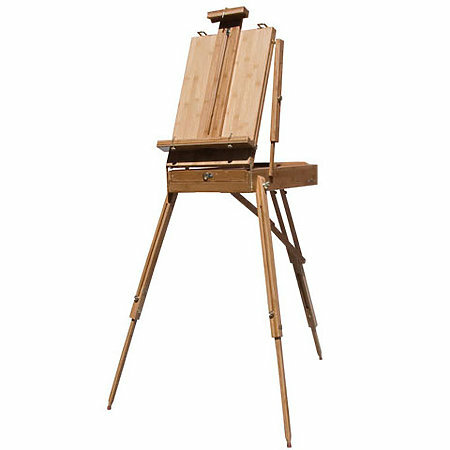 The Bamboo Sonoma Sketch Box is a fully adjustable field easel and storage unit all in one! Made from renewable bamboo and finished with brass hardware, it features a sliding drawer with divided compartments, a removable wooden palette, adjustable shoulder strap and a durable leather handle. Perfect for painting outdoors or at home. Adjusts easily from 45í to 90í and extends to a full height of 71". Accommodates canvases up to 34". Dimensions: 28-1/2"W x 45"D x 71"H. Fully assembled.